LOS ANGELES, Calif. --- "We better hope the party supply place does returns," said exasperated Adventist events manager, Maria Romero, as she stood in a half-decorated downtown Los Angeles hotel ballroom. 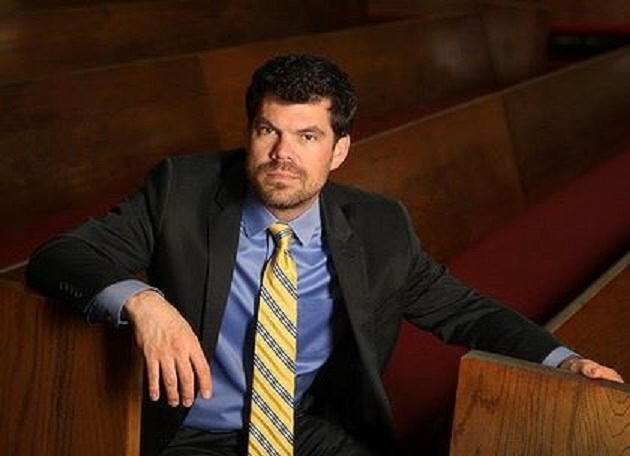 Plans for what many Adventists hoped would be a New Year's Eve party to welcome former Adventist Pastor Ryan Bell back to the fold had been scrapped after an NPR interview in which Bell admitted that after his Year Without God, he had come to the conclusion that there was no God. The former Adventist pastor who most recently shepherded Hollywood Seventh-day Adventist Church had embarked on a year-long experiment at the start of 2014 in which he would "live as if there is no God" and blog about his journey. "Now I wish I'd read his blog more," said Romero. "I could have seen this coming and booked some better-paid baby dedication gigs in Orange County instead." Other Adventists involved in planning the event for Bell reacted differently: "We aren't used to our pastors drawing worldwide attention and we definitely aren't used to our leaders openly struggling with their faith or lack of it," said Tyler Cameron, a member at Hollywood Adventist Church. "This year has been a journey for all of us. I will miss Ryan as my pastor but I'm glad he's still my friend." Southern California Conference representatives on the party planning committee could not be reached for comment as they were busy writing post-termination no-blogging clauses into all new employment contracts. My blog lost readers after my termination, but I’m certain my conference felt the same. Canceled?! I was in charge of the coffee. What am I supposed to do with all this Roma?! Humorous story summing up a very sad situation. Yeah, sad that more Adventists don’t follow his lead. I would say this is a cause for celebration. It is a starting point for him, and an authentic expression of someone who allowed himself to use his logic, to examine his honest thoughts and feelings without the noise of what’s “expected”. Religion is an entity that exists on followers who support with money. This causes a climate not of honesty and truth, but a perpetuation of that which encourages conformity and discourages thinking. I agree with Daniel. And I don’t suppose this is so funny in heaven. But let’s face it, this is just another example of Adventist bad planning. Dressing up as a homeless group (we could have used the Dorcus sweaters to make it look real) in an area where Bell now “ministers” would have made for the perfect surprise party. We could have invited prominent officials from ADRA, whose mission outreach also includes avoiding mentioning God, to be a part of the festivities. Knowing Bell’s rejection of God 12 months before his official announcement it’s tragically inexcusable to miss such a perfect opportunity to welcome him back into the fold of saving the world (from poverty). Well, at least Lisa doesn’t buy into the myth of climate ‘change’. Shouldn’t the silly prick have looked into what he believed before becoming a pastor. Not change tack in the middle and damn God ? Not a fan of name calling. Please avoid doing so if you can. Thanks. Check out “Mere Christianity” by C. S. Lewis. Logic and science, only lead you to a creator, if you have the courage to ask the right questions. That’s where C. S. Lewis found they led him, but they have led other people to other conclusions. There isn’t any, unless you accept, on faith, that the universe is too complex to have happened without a Creator, ergo, there must be a Creator, or Intelligent Designer, or God . . . but, faith is not evidence, faith is not logic, faith is not science. Matter. Glad you said evidence and not proof. I wonder if Bell would have asked this question at his welcome home party? Ryan Bell missed the church home coming party not a scientific convention in Vegas. But had he studied science he might have had a different outcome had he asked the question of “how” did everything come from nothing at all? But then that gets into logical interpretation of scientific evidences. …You will get no welcome back party and no going away presents, none, zip, nada. But you might get uncertainty and a not so peaceful, easy feeling. Put me down with team goat herders, at the least they lived and died with purpose in this life, and certainty and hope for the future. “If there are gods, and they are just, they will not care how devout you have been, but will welcome you based on the virtues you have lived by. “If there are gods, but unjust, then you should not want to worship them. “If there are gods, and they are just, they will not care how devout you have been, but will welcome you based on the virtues you have lived by.”—Apparently, Marcus was not sure if there were gods but seemed certain that an objective standard of justice and virtue would guide the invitation to their welcome home party. “If there are gods, but unjust, then you should not want to worship them.—Unless, of course, not worshiping them resulted in either your death or some other bad consequence like not being invited to their welcome home party. “If there are no gods, then you will be gone, but will have lived a noble life that will live on in the memories of your loved ones.”—At least for one or two generations then any memory of all the noble things you’ve done will have been forgotten. And then there would be those of a more Epicurean mindset that would swear that you wasted a perfectly good opportunity to party down which would prove to them that you weren’t nearly as cool as you thought you were. Plus no one would care anyway. Like, how did Marcus Arelius really live and what has he done for you lately? Any humor taken at the expense of Ryan Bell is out of place. I believe he is sincere, although mistaken, and poking fun at him will not help him. Here’s the conundrum for Adventists and all other religions. If faith is proof of truth, then every religion in which anyone has faith is, ipso facto, true. If faith is proof of truth, then every political and philosophical ideological in which anyone has faith is true. And if faith is proof of truth, and Ryan Bell has faith in the non-existence of God, then Atheism is also true. If faith is proof of truth, then Deism, Theism, and Atheism, are all true.